The day I took delivery of my 1973 Mercedes-Benz 450 SL five years ago. Somewhere about 1,000 miles southeast of here, I reckon, the Duesseldorf Express cargo ship is plying the coastal waters of the Pacific Ocean. A container, with my 1973 Mercedes-Benz 450 SL, is loaded on the ship, among the thousands of containers that ship can hold. The ship left Manzanillo two days ago, and is due at the Panama Canal in three days. After that, it will be another three weeks, mostly lonely days at sea, until the Duesseldorf Express arrives in Genoa, Italy, where I plan to pick up my car. “Sea days”, as they are called in the maritime industry, when you are just chugging along between far-off destinations, usually with no land or other sign of civilization in sight, are good days for thought. Today, I’m thinking about a conversation I had four years ago, at a classic car auction near Lake Como in Italy, with Rob Myers, the founder of RM Auctions. “Do you think my 1973 SL 450 will ever be worth anything?” I asked Rob. My question was based on watching a 1971 280 SL being auctioned off that night for a price approaching six figures. Older SLs are just about untouchable these days. I think I had it insured then for about $10,000. “Pristine examples are worth up to $30,000 now,” the underwriter told me. “I assure you mine is not a pristine example,” I told him. It could use a re-paint and new leather upholstery. But I did increase the coverage to $15,000, as I recall. Yeah, if somebody wants to give me that kind of money for my 450, I’ll personally deliver it, hand them the keys, and walk home. Yet the cars are certainly becoming a little more rare these days, as they become more costly to keep on the road, especially the first-year 450 SLs like mine. But there are still a bunch of them on the road, especially in places like Southern California, where they have a cult following. But one place where you don’t see a lot of them anymore is along the Mediterranean coast of France and Italy. Old cars of any kind are really rare around where I live; maybe rust, or extreme maintenance costs, lack of parts and such concerns are key factors. It appears that old SLs are a pretty hot commodity in these parts. I’ve seen a couple since I’ve been here, and they are considered real collectors items. Prices in classic car guides are strong – $25,000 is not an uncommon price to ask, for the few that I’ve seen. And they weren’t in as good condition as mine, or as well-equipped, or the right year, etc. My Mercedes is a bit of a mystery. I stupidly bought it off eBay five years ago. My local dealer said it had “no record of the car ever being serviced at any time, at a Mercedes dealership anywhere in the world” in its 40+ years of existence before I brought it in for an oil change. The oil looked original. I spent a couple of years tinkering with it to get it running right. Generally, it’s been pretty reliable since then, although it decided it didn’t want to start, the day the truck arrived to take it away to the shipping container. (Maybe it was trying to tell me something.) The crook I bought it from had fiddled with the odometer; the air conditioning compressor seized up two years ago; but that’s about it. AC is a big deal in California, but not the Côte d’Azur, where I hope the top would be stored in the garage all the time! 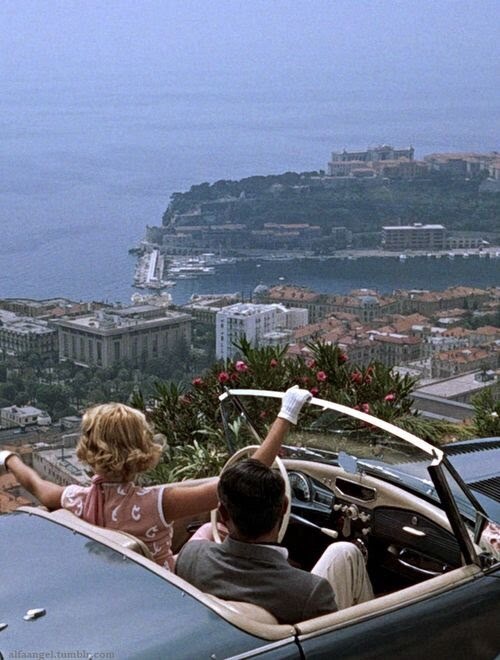 Monaco Dreamin’: Grace Kelly and Cary Grant filming “To Catch A Thief” in 1955. Yeah! So that’s the type of stuff I think about on a “Sea Day”.